NSCAA Fundamental of Coaching This series of short lessons is designed to introduce volunteer and youth coaches to the basics of coaching soccer. Topics covered include Laws of the Game, Basic Skills, Tactics, etc. "Offside Rule Animated" (Lo Res / Hi Res). Your Coaching Education Director (CED) is Dave Gleason( ). Coach Dave is happy to help you or point you in the right direction regarding coaching topics such as coaching education needs, practice ideas or issues, or general soccer questions. You should continue to see your Division Coordinator for other issues. PYS plans to offer in-house coaching education clinics by qualified professional coaches throughout the year. 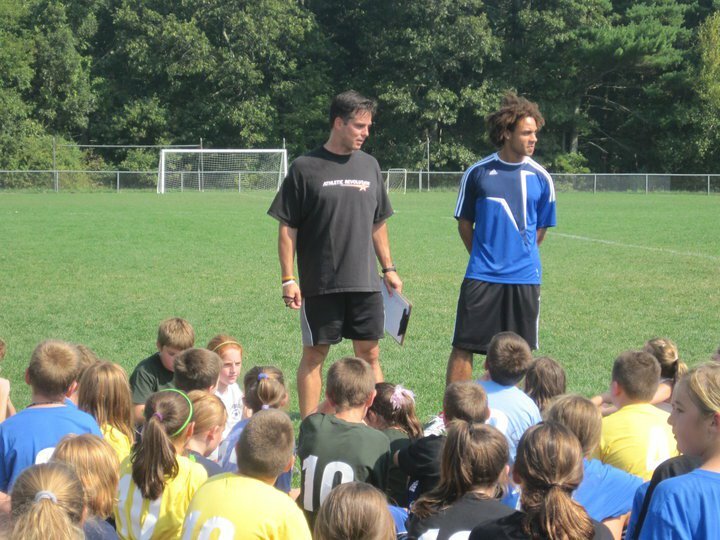 The Mass Youth Soccer G license course is an important orientation and primer for anyone coaching youth soccer. It is offered on line by clicking here massyouthsoccer.g. The course offers the most updated and contemporary methods to leading activities for young children and coaching the game of soccer. The MYSA F and E license courses build on the G course. These courses will instruct coaches on methods for older youth players. PYS encourages all coaches to attend these courses. PYS will reimburse active coaches up to $160 per calendar year for approved coaching courses. Eligible courses include clinics and license programs offered through Mass Youth Soccer and USYSA. Other courses should to be brought before the PYS Board for approval prior to enrollment. For most courses including Mass Youth Soccer courses, you would typically register and pay online. After attending the course you must send proof of payment and completion to the PYS Treasurer and you will receive a reimbursement check in the mail shortly thereafter. Coach Registration - Any person over age 18 who is expected to coach, assist or in any way be involved with a PYS players is required to be registered and CORI checked. Registration of coaches is CRITICAL because it ensures that the criminal background checks that are REQUIRED by the Commonwealth of Massachusetts are performed confidentially through the Mass Youth Soccer CORI/KidSafe Program. It also provides medical and liability insurance coverage for the coach/volunteer and PYS. This applies to all age groups for both fall and spring seasons. Coach and Team Volunteers must be registered with MYSA every year and CORI must be updated every two years. CORI/KidSafe Link - State law requires that all coaches and volunteers complete the CORI/KidSafe process so a national background check can be performed. More information on the Mass Youth Soccer CORI Program can be found by clicking this link. Your CORI Coordinator is Mike Tropeano ( ). Pembroke Center Library - Soccer Resources - PYS has provided the Pembroke Center Library with several videos and books to help our coaches and players. EA Sports Online Interactive Training - EA SPORTS and U.S. Soccer have teamed up to create the second version of EA SPORTS Interactive Training, a free, online tutorial that uses EA SPORTS technology to help train the soccer stars of the future. US Soccer Coaches Resources - Coaching resources and links from U.S. Soccer website. Best Practices for Coaching Soccer in the United States - From U.S. Soccer, this 70-page “Best Practices for Coaching Soccer in the United States” coaching book serves as the sport’s definitive new player development guidelines and is available now as a free download. The new “Best Practices” document represents a series of recommendations compiled and reviewed by U.S. Soccer’s Director of Coaching Education Bob Jenkins in conjunction with the U.S. Men’s and Women’s National Team coaching staffs. Mass Youth Soccer Statewide Curriculum - This shows you what you should be teaching at each age group and gives you practice sessions to show you how..
Small Sided Game Practice Ideas - 1v1, 2v1, 3v3, 4v4 and more. Playing to goals or to lines depending on what you want to emphasize. FineSoccer.com - Information on how to become a better player or coach. Has newsletter feature which allows you to receive inforation via e-mail on different topics. Also checkout the FineSoccer.com Free Drills Database. Soccer-Coach-L Coaching Manual - A nice coaches manual published in 1998. NSCAA (National Soccer Coaches Association of America) - Coaching tips, coaching courses, news, high school and college rankings, and more. Soccer America - Soccer's newspaper. Free issue offer. Soccer Rules Summary (including PYS and Coastal League Rules) - Created specifically for PYS coaches.